ebook PDF (106 pages, 2.55 MB), Kindle (mobi), etc. Apache Cassandra is an open-source distributed database system noted for its consistency, its ability to run on commodity hardware, and its easy deployment to cloud infrastructure. 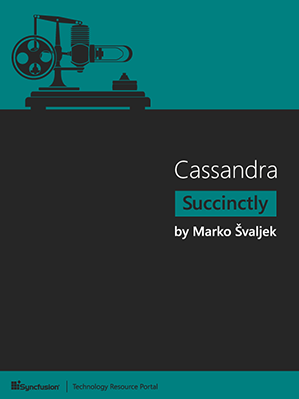 With Cassandra Succinctly by Marko Svaljek, you will learn the architecture behind Cassandra that makes it a reliable system, including how hashes are used to identify where data is stored, how choosing the right replication factor can enhance or hinder performance, and how the system handles updating and deleting data. By the end of the book, you will be able to store and model data using the Cassandra Query Language, and use Cassandra within your own applications. Marko Svaljek is a software developer and blogger with almost 10 years of professional experience in front end and back end development for leading financial and telecommunications companies in the Central European region, with emphasis on machine to machine, mobile banking, and ecommerce solutions.